Each third grader in the tour group was given a Money Museum Fun Guide and a little green box of colored pencils. Printed on one side of the box was Federal Reserve Bank of Kansas City and on the other Made in China. IOU/USA is a temporary public monument for Memorial Hill Park designed by artist John Salvest. Towering over visitors at a height of almost seven stories, IOU/USA is comprised of 105 multi-colored steel shipping containers, stacked seven high and fifteen across. Conceived in the summer of 2010, and developed over the course of the past year, this striking installation is unfolding in Kansas City at a moment of exceptionally divisive national politics and public discourse. At the writing of this essay, Democrats and Republicans in the U.S. Congress had just reached an agreement to raise the United States’ debt ceiling and cut spending by 2.5 trillion dollars over the next several years. Negotiations for the agreement played out against a backdrop of dire warnings about impending political and financial crisis. Now that a deal has been struck, the requisite chorus of relief and reflection is echoing across the mediasphere. Headlines say a crisis has been averted, but at this point no one is na•ve or hopeful enough to believe that other major financial meltdowns and scandals aren’t festering in the wings. We live in a crisis culture, and its present effect is that many of us seem to be suffering from one form or another of post-post 9/11, recession-induced PTSD. IOU/USA is an artwork designed to reflect upon this current state of affairs, while resisting didacticism and an easy read along party lines. While some may interpret its site and orientation in proximity to the Kansas City Federal Reserve Bank as a direct critique aimed at the activities of the central bank, others may view the project as a cathartic response—perhaps defiant, perhaps submissive—to the stresses of mounting personal debt which millions of us know intimately. Of course neither of these takes is exclusive of another, and activists of most any persuasion could read the work as a rallying cry for their own ideals. This multivalence is what makes IOU/USA potent as a work of art. At a moment when many of us feel disillusioned by our leaders and disconnected from much meaningful or productive dialogue, IOU/USA points to the scope and scale of our individual and collective agency, however we might choose to deploy it. Artworks rarely solve problems, but people do, and the questions embedded in IOU/USA suggest a long overdue reckoning. What am I part of? What do we owe? Why should we owe it? Is America still a nation of opportunity? Everyone has a need for agency, a sense of dominion over self and environment. Agency costs. It exacts a price. What is this price? What is agency worth? Whatever it is worth, what does it mean to accept its costs? IOU/USA is a complex and costly endeavor, as one might well imagine based on its scale alone. While much of what has gone into the project is beyond the scope of this short essay, there are a few things in relation to cost and logistics that must be noted. First, the project is privately funded. Second, some of the project’s most illuminating costs can’t be quantified. Public art is often contentious in part because it demands participation—an activation of agency—from those who might strongly prefer to stay on the sidelines. On an individual and institutional level, reputations are always at stake, and even those who are enthusiastic about an exciting new project must move cautiously to avoid breaking rank. Thus, as frequently happens with public art anywhere, the permission process for IOU/USA lurched along unpredictably as various gatekeepers (official and unofficial) made decisions about whether to embrace or distance themselves from the project, and to what degree. Among these gatekeepers was, of course, the Federal Reserve. The Fed has no true jurisdiction over the park, which is city-owned land, but it did what it could to block the project, up to a point. Once it became clear that Grand Arts and the artist were willing to fight publicly for the project on First Amendment grounds (and that this could be embarrassing for a reserve system professing greater transparency) the dust settled, and our project was approved. For Salvest and Grand Arts’ part, we have been gratified by the assistance we have received from some seemingly unlikely sources—including, at the moment, the Federal Reserve.iii At the same time, there have been many difficult decisions and small sacrifices along the way as we’ve negotiated toward the larger goal of making the project happen. Agency exacts a price, indeed, though what we have willingly paid as part of this project is minute compared to the sacrifices enshrined all around it. Bounded on three sides by city-owned park land, Kansas City’s Federal Reserve Bank building rises fourteen stories on a hill to cut an imposing silhouette in an otherwise open swathe of sky. If it were downtown and home to anything other than the Fed, this tall beige building with reflective black windows would be unremarkable, but in the context of the park, it nearly begs for interpretation. Inside the park, a few hundred feet to the north and west of the Fed, the Pioneer Mother Memorial, designed to pay tribute to the women of the westward expansion and gifted to Kansas City in 1927 by the businessman Howard Vanderslice (who notably also donated the land that became the Kansas City Art Institute) rises through clusters of tall grasses. To the north and east of this, a flat expanse of mall unfurls toward the National World War I Museum and Liberty Memorial: the latter stands at 217 feet, piercing the city’s skyline, and beaconing visitors to a patriotic pilgrimage honoring warriors of a bygone era. West of the Memorial, snugly planted at the bottom of the park hill, a sprawling IRS complex stretches out in low profile. IOU/USA insinuates itself into this matrix of memorials and monetary stockpiling as a temporary intervention that could, at least for a short time, help to reframe what is firmly entrenched in the permanent architectures which surround it. While the Liberty Memorial and Pioneer Mother look to the past, and the Federal Reserve literally houses the stuff of current debate, IOU/USA offers itself as a fleeting note to the future written in the indelible font of global trade. 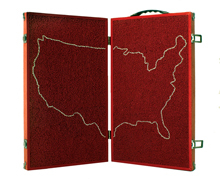 What will a growing U.S. trade deficit mean for our individual livelihoods? How personally invested should we be in the size of the national debt? What should be the role of the Federal Reserve Bank? Is our current economic system the most viable, the most humane? 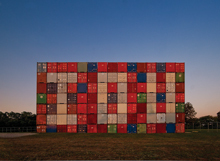 IOU/USA evokes pressing questions about the future, but its haunting architecture of emptied-out cargo containers also summons the uncanny of the recent past. This theme runs throughout Salvest’s oeuvre, which is rooted in the multiple, the ephemeral and the discarded. Here, it is anyone’s guess what the containers of IOU/USA may have held just days or weeks ago. Some have been making their way across ocean trade routes; others have been used mainly for personal storage in our country of hoarders and foreclosures. Americans embrace the cognitive dissonance of stuff as religion—our heaps of things give us shape, while simultaneously threatening to do us in (environmentally or otherwise.) The advent of the humble steel shipping container as an instrument of global trade and personal accumulation has enabled us to practice this faith with extraordinary fervor—beginning early in life with disposable plastic sippy cups, and ending, for some, with discount caskets shipped from China. Salvest’s concurrent installation at Grand Arts, titled New Cornucopia, extends this notion of the uncanny in our excesses. The installation features a single green China Shipping container with its doors thrown open, and a riotous mess of imports spilling out onto the gallery floor. In this baroque cornucopia for the 21st century, all manner of objects promising a better, more organized and fulfilled life mix with momentary amusements and souvenirs gone wrong. Beholding this heap of junk with its static-tuned televisions hissing back at us, one can’t help but wonder, is this what the good life looks life? How much did we pay for this stuff, anyway? God or Bernanke help us if we put it on a credit card. i - Quote from Salvest’s proposal for IOU/USA explaining part of the inspiration for the project. ii - William Pope.L, “Agency and What You Can Do With It,” in Anne Pasternak, Creative Time: The Book, Princeton Architectural Press, New York, 2007, p.126. iii - Representatives from the Federal Reserve have taken a variety of positions on the work. At the Kansas City Board of Parks and Recreation meeting in which the project was given final approval, the Reserve went on record to oppose it. Despite this, the bank has been accommodating in making its canine explosive detection unit available for agreed-upon inspections of the empty containers. Thank you to Kansas City, Missouri Parks and Recreation and the Municipal Art Commission for their cooperation. We would also like to offer a special thank you to Belger Cartage Service, Inc. for their support of this project. The following individuals and corporations have also offered generous assistance with the realization of this work: Porter Arneill, Les Christensen, Adam Hogan, Arkansas State University, Destiny Vinley, Rhei, Kate Hackman, David Hughes, Action Sales and Rental Inc., CEO Structural Engineers, RGB Mechanical, Pac-Van, A Box 4 U, Mod-Space, A-1 Rentals, Mather Trailer and Container Storage, Kansas City Piggyback Inc., Huddleston Machinery Moving LLC and Hurst Construction. "Kansas City public art project takes on debt" Associated Press, accessed at artdaily.org. "Containers Used to Protest Federal Debt" By Bonne Alter, treehugger.com, October 6, 2011. "7-story Tall 'IOU/USA' Art Exhibit Near KC Federal Reserve" Missouri News Horizon, September 19, 2011. "IOU/USA Makes A Brazen Statement" By Bettse Folsom, examiner.com, September 11, 2011. "Sticking it to the Fed" By Nathan Zoschke, University News, August 29, 2011. "IOU: 65 Foot High Sculpture Inspired by US Debt" By Maria Sudekum Fisher, MSNBC, October 2, 2011. "A Big Bank Statement" By Alice Thorson, Kansas City Star, September 18, 2011. 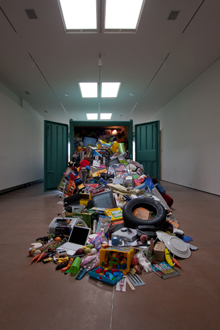 "New Cornucopia and the Big IOU" By Amir, Beautiful/Decay, August 22, 2011.